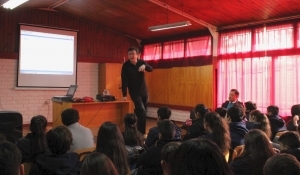 The National Exact Sciences Awarded and member of CAPDE, met with students inseventh and eighth grade, who were surprised by the extent of mathematics. An interesting invitation, as part of the celebration of the 50th anniversary of the emblematic Villa Santa Elena School, located in the commune of El Bosque, received the academic from the University of Chile and researcher at the Center for Nonlinear Analysis & Equations Partial Differentials (CAPDE), Manuel del Pino. According to the coordinator of the establishment and manager of the meeting, Elena Ogaz commented. “The invitation comes from the context where the school is located and from the demotivation that we see many times in the students, mainly with respect to mathematics,” she said. During the visit, which brought together about 60 students, managers and teachers, the academic presented part of his work at the Research Center, CAPDE, corresponding to the Millennium Initiative. “It was very interesting to talk with the children of the School Villa Santa Elena. I showed the video of CAPDE, which shows the viewer that mathematics leads to symbolic descriptions, with tremendous sense and depth of reality and its models. And how this leads to either the liquid crystals on the screen of a cell phone, the aerodynamic design or models of climate prediction or disease spread. I wanted to emphasize this concept of mathematics after reality, “said the mathematician. It is worth noting that the Villa Santa Elena School is celebrating its fiftieth anniversary, raised for the first time in the time of President Frei Montalva, in this population of “take” and whose vulnerability index exceeds 85%. It is for this reason that this kind of visits and motivational talks becomes more relevant. This was highlighted by Elena Ogaz. Meanwhile, Manuel del Pino stressed that “the effort to rescue the history and dignity of this school seemed very valuable. It was a very interesting experience. Santiago has many ghetos and for this school, that people go there to show to the students that there is another world very close in which they can develop, and that with tenacity and study they can have it at hand, that is the message I tried transfer. In short, an emotional experience and mutual learning, “said the researcher.